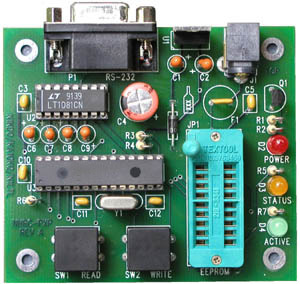 The programmer pod can be used without a computer to copy X2212s. It does this so fast, you will think it is broken. When coupled with the Phoenix, PhoenixScan, and DeltaSX software, the NHRC-PXP will allow you to create new radio programs, edit existing programs, print a radio program report, and store radio programs in disk files. Click here to see a screenshot of the PhoenixScan software. The NHRC-PXP software also includes a "raw mode" program that will allow the programmer pod to read and write X2212 data from binary disk files, and import Niles-compatible program files. Copyright © 2005 - 2016, NHRC LLC, all rights reserved.